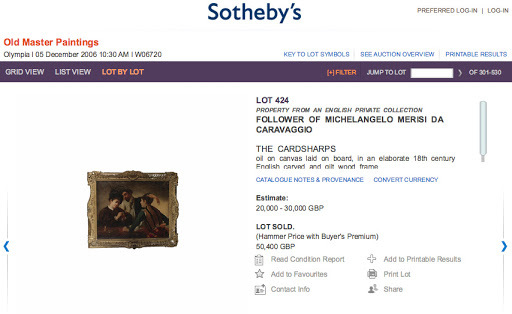 More than six years after the sale, Thwaytes is accusing Sotheby’s of failing to undertake proper research and analysis of the work before the sale. Claimant is seeking damages, interest and legal fees based on the fair market value of the work at the time of the sale in 2006. This case is akin to the challenged brought in court against Christie’s misattribution of a painting now thought to be by Leonardo da Vinci. In the Caravaggio dispute, the Sotheby’s position is that the painting is a copy, and this position is supported by a number of experts, including art history professor Richard Spear, and Caravagio experts Helen Langdon and Sebastian Schutze. Thwaytes’s position is also supported by eminent Caravaggio scholars, including Mina Gregori, Maurizio Marini, Antonio Paolucci (of the Vatican Museum), Daniele Benati (Bolognese art expert) and Ulrich Birkmaier (of Wadsworth Atheneum). The battle of experts is about to break. Fortunately, in this instance, experts seem to be eager and willing to give their opinions unlike some of the authentication committees and foundations in the United States. *Surgeon Captain Thwaytes, according to Sotheby’s Catalogue Notes and Provenance for the piece was an important Caravaggio collector, who’s copy of “The Musicians” was sold to the Metropolitan Museum of Art (image above). Next Next post: Goulandris Affair: Who sold the Art and Why?